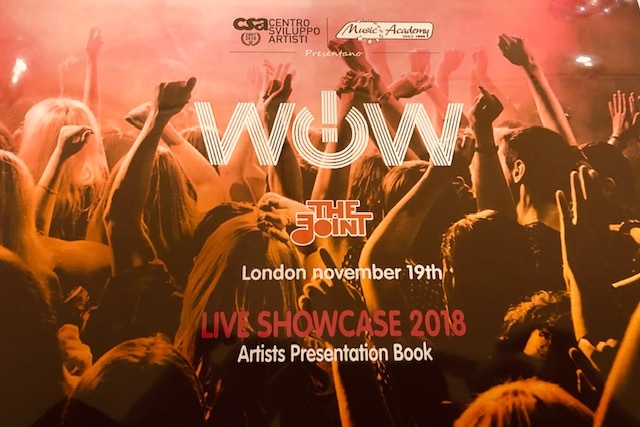 Monday November 19th was the WOW London showcase event, which is a huge highlight for our BTEC Higher National Music students who attend the Music Academy in Bologna. Students are selected to travel to London to perform in front of industry experts at the prestigious Joint Studios in London, where the likes of Adele, ColdPlay and Sam Smith rehearse. Students present a wide and diverse variety of skills through the selection process, including songwriting, music production, instrumental and performance skills. Once selected, the artists are required to select appropriate material to present to the panel and give a brief overview of their artistry. Three artists performed to the panel, all currently on the HND in Music programme: Aliotho (electronic/pop duo) Rosso Malpelo (Pop/Folk artist) and Alys (Pop artist). All the students were wonderful - enthusiastic, excited, understandably a little nervous - but overall you could clearly see how thrilled they were to be given this opportunity. They were so eager and keen to hear our thoughts and accept any advice and guidance on their next steps. The panel consisted of Marisol Estevez (Regional Development Manager for Pearson), Mike Smith (Music Manager) and me. Aliotho is a duo made up of DJ/Producer and musician Guido Licciardello (Amp) and vocalist Ludovica Nanfito (Hebi) and were described as ‘ creating a current, fresh and catchy sound merging exotic and soft sounds to a typical electronic flow’. Originally, they met in Sicily working on rearrangements of pop songs, but then progressed into developing their own material, which they performed at the showcase. They opened the event, which is always a hard thing to do - no one ever wants to go first! But they did very well and eased us into event beautifully. Their vocals worked really well together and they used the stage well to help the audience engage with the lyrical content. Rosso Malpelo was described as ‘an extrovert, rebel filter, insensitive to the fear of exposing oneself and that this side of his personality only emerges when he’s on stage to speak through his music - a means of venting, the true core of his soul’. Rosso was so on it and clearly the most experienced of the artists performing. He gave me a copy of his CD, and is already has a developing social media profile and using it well. We were both sharing photos etc on Instagram stories and Facebook and he was using this marketing opportunity well. This is one of the key things I advise students about - the business side of Music - so it was really great to see this artist is already developing marketing strategies and understand what he needs to do to progress. Finally Alys, who described herself as ‘willing to work hard and make sacrifices, curious, emotive, determined, ambitious and open minded’. She was the youngest performer (17) but actually the most fierce - and sassy in the right way. It’s extremely hard for young, female singers to stand out from the crowd - the market is completely overcrowded. However, Alys is already shaping her work and creating her own sound, image and approach to her work. She stood out to me for many reasons, not least of which because she gave me a piece of paper at the end (no social media profile yet) with her contact details and on the back she had written ‘willing to work hard’. Love it. Social media profiles are essential for artists. Even now, you may be reading this blog and be interested to hear some of the artists I have mentioned - but you can only find out about Rosso Malpelo at the moment - unless you happen to go to Bologna and bump into the others. These musicians are training to explore exactly what they need to do to pursue their goals - and social media is one part of it. This was a great experience for the students and you could really see how much they valued the trip to London, the opportunity to perform and to receive genuine industry based feedback from professionals. Feedback from industry professionals is an essential part of a musicians training. The music industry is extremely hard and making the right impression can be a career make or break time. Crazy but true. These students are clearly passionate and ready to take on the challenge. I hope they go for it. Hi everybody! I'm Fiona Ross Subject Lead for Music and Performing Arts. I have been working in the Creative Arts Industry for many years with my first professional job at the age of 2. I studied dance, drama and music at Arts Educational and the Royal College of Music and I am still actively working in the industry. Alongside that, I have been working in education for nearly 20 years and my role prior to joining Pearson, was as Head of the British Academy of New Music. Alongside this, educating young people has been one of my passions, and I was Head of British Academy of New Music, London, for nearly nine years, where I was responsible for the training of Ed Sheeran, Rita Ora and Jess Glynne, to name a few.